(1975) Moffett’s Chicken Pie Shoppe, Arcadia | Remains of L.A.
-stylized country decor, light pine tables, gold checked wallpaper, curtains on the partitions between booths, decorative hutches, blue willow plates, painting of farms, and ceramic chicken statues on shelves. At the top of the walls there’s a wallpaper border with pictures of chickens. I never understand the way places that serve chicken want to constantly remind us what live chickens look like. There is a small take-away area by the door where you can also buy frozen pot pies to take home, and a counter shaped like an L, that runs along two sides of the area where the servers pick up the food. -I sat at the counter, with a couple stools between me and the corner. I always count stools when I sit alone at a lunch counter, to make sure I’m not making things difficult for parties of two if the place gets crowded, and also so other people eating alone can leave an empty stool between us. -I got the chicken pot pie dinner. There were green beans with it, which tasted exactly how I like them–like Green Giant green beans fresh from the can. It’s entirely possible they weren’t, they could have been picked that morning, but I’m pretty sure they were canned and whatever, they were delicious. The mashed potatoes were good too, but the important thing was the pot pie. Incredible. I actually closed my eyes when I took the first bite, then felt silly and hoped no one noticed, then did it again on the second bite. Astonishingly delicious. The meal also came with a salad, and the waitress told me they usually dump garbanzo beans on top and did I want that. Really glad she asked, because no. There was also a thick piece of fresh baked bread, and with it one of those jars of honey shaped like a bear. I could eat those pot pies for every meal forever and be happy, maybe. -Right after I sat down I realized the TV directly over my head was showing Fox News. I can’t stand those guys, but it was okay; the sound was off and I was wearing my baseball cap so the brim kept it out of my peripheral vision. I only looked up occasionally, to make sure they were still horrible. -While I was scribbling down descriptions of the place a guy and his daughter, who was maybe nine or so, were leaving and the guy stopped and said something to me. I didn’t hear and asked him to repeat it, so he explained that his daughter had wanted to know why I was taking notes. I got kind of flustered, he was standing a good ten feet away, calling over to me in a small restaurant. I did not want to tell everyone in the restaurant that I was going to be writing about it on my blog. So I lied and said I was just making a list of things I had to do for work and he said something jovial about “making a list and checking it twice” and they left. 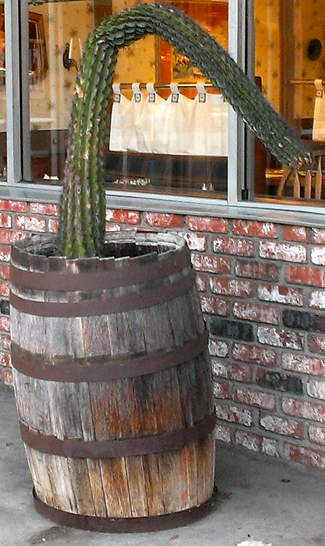 -Outside the restaurant, where I could see it through the window, was a tall thin cactus planted in a barrel. The cactus had grown straight up for a while, then apparently given up and started to bend. It looked like a giant crooked finger. -A few stools down from me a man who looked remarkably like an older and harder-used John Goodman was having a spirited discussion with his wife. It seemed like they agreed completely, and were having an imaginary argument with people who disagreed who weren’t there. Which is fine, I do that all the time, but the man felt so strongly he kept slapping the table to punctuate his points and it would make the whole counter shake, which I’m pretty sure he didn’t realize. -Over by the take-away counter, which I was facing, was a large screen showing a security shot of the parking lot. There was also a desk with a small filing cabinet, a calculator, and a printer. 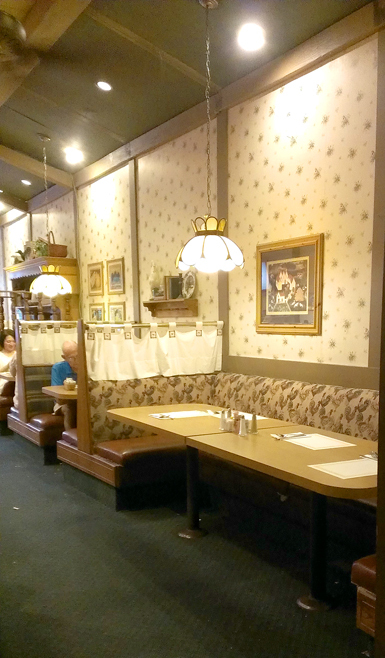 It didn’t at all match the super-decorated part of the restaurant, and I liked it. -While I was eating, the manager (owner?) sat down at the counter on the other side of the corner, so he was at a perfect right angle to me, just a few feet away, with no one between us. It made me feel very self-conscious about taking notes, especially after the guy asking about them. Since I was also reading while I ate, and just making notes occasionally when I noticed something, I starting trying to make it look like the notes were about the book I was reading, peering at the page and then writing, and peering at the page again. I don’t know why, it’s not like it’s against the rules to write things down about a restaurant. -One of the waitresses is going to have Friday, Saturday, and Sunday off next week, which doesn’t happen often, but she can’t really afford to go anywhere. The manager (owner?) suggested she go to a casino. -A woman at the take-away counter got into a big conversation with the waitress about white meat vs. dark meat. She kept asking questions and then when the waitress would answer she’d say, “I know, I know,” and then ask another question and respond to the answer the same way. -My dinner included dessert, but of course I can’t have sugar. There were a lot of boxes of tea on a shelf behind the counter, so after checking that they didn’t have sugar-free versions of the jello or pie, I asked if maybe I could have a cup of hot tea instead? 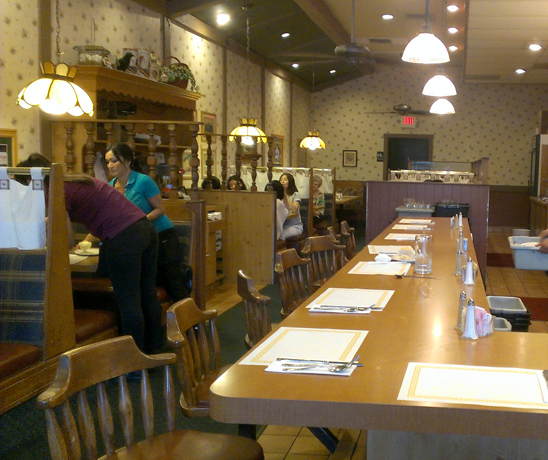 The waitress said she’d have to ask and turned towards the manager (owner?) who was still sitting right there, listening, and he said, “no!” shaking his head with a big frown. Which, I mean, I don’t know, is a tea bag and some hot water really more expensive than a piece of pie? His brusqueness made me want to get a piece of pie and then just not eat it, but that would have been rude and also I didn’t actually think of it until about an hour later. What I Read While I Ate: still reading “Audrey Wait!” by Robin Benway. Super YA about a girl whose ex-boyfriend writes a song that becomes so famous she becomes famous too. Sounds gimmicky, but the characters are fantastically real and I love the descriptions of music, and what it’s like to love music. What Sort of Ghost I’d Expect to Find if I Believed in Ghosts Which I do Not: Two little girls in prairie dresses, whose grandparents would bring them here for Sunday dinner when it was too hot to cook. Note: Unless otherwise stated, all ghosts mentioned in this blog died peacefully of old age and then reverted to the age/place of their choosing.